Evelyn Elizabeth Robinson Hardin, the eldest of seven children, was born to Walter C. Robinson, Sr. and Cora B. Adair Robinson on April 29, 1914 in Chattanooga, Tennessee. She answered her summons and transitioned peacefully to her eternal heavenly home on Friday, October 26, 2018 at her home with her daughter and grandson at her side. She was preceded in death by her parents, her husband, George Solomon Hardin and four sisters, Jessal Robinson, Marian Robinson, Alma Robinson Poole and Lois Lucille Robinson Blakemore. Mrs. Hardin was educated in the Chattanooga Public School System and graduated from Howard High School in 1932. She matriculated at Tennessee A & I State College (now TSU), Nashville, Tennessee. During her senior year, Delta Sigma Theta Sorority was established on campus and Evelyn Robinson was one of six young ladies who became Charter members of the Alpha Chi Chapter in May, 1936. That year, she graduated with a B.S. Degree in Education-becoming the first in her family to graduate from college and later received her M.S. Degree in Education in 1961. While on campus at A & I, she met her husband, George Solomon Hardin of Nashville and they were married on October 29, 1939. To this union, their daughter, Sandra, was born and the couple experienced 52 wonderful years before he passed away on May 4, 1991. After her 1936 graduation, she worked for one year, as a secretary, at the office of her father, Mr. Walter C. Robinson, the Editor and Publisher of the Chattanooga Observer Newspaper. Next, she found work in three different counties in Tennessee, teaching at both the elementary and secondary levels in McMinn, Rhea and Hamilton Counties. She completed her career as a Special Reading Teacher in Hamilton County; and retired in 1975 after 33 years of teaching. She loved her students and they loved her. She taught not only academics, but inspired her pupils to reach for the stars. She found great pride and joy in the many young people who credited her for contributing to their success. 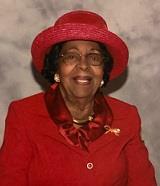 Mrs. Hardin has also been a source of inspiration to Delta Sigma Theta Sorority. In May of 1941, the Beta Epsilon Sigma Chapter (name later changed to Chattanooga Alumnae Chapter) of DST was chartered in Chattanooga. She was one of thirteen Charter members of the chapter. Thus, she had the distinction of being a dual charter member of both the Alpha Chi Chapter and the Chattanooga Alumnae Chapter. (She was also a Charter Member of the Quettes Club—the wives of Omegas.) In 1996, she was inducted into the CAC Delta Sigma Theta – African American Educators Hall of Fame. In 2011, the Alpha Chi Chapter at Tennessee State University helped set up the Evelyn Robinson Hardin DST Endowed Scholarship Fund. This fund is currently helping collegiate Delta women achieve their goal of receiving a college education. She received awards at the 50th, 75th and 80th Reunions of the Alpha Chi Chapter and received awards at the 50th and 75th Reunions of the Chattanooga Alumnae Chapter. Each year, she attended the CAC Founders Day Program, until her health began to decline. In 2013, she traveled to Washington, D.C. and participated in the DST 100th Anniversary Celebration. Through the years, her beloved sorority presented many awards to her, for years of dedicated and loyal service. As a Diamond Life Member, she considered her membership in Delta a lifetime commitment, one that she truly honored and held in high esteem. Mrs. Hardin also had a lifetime commitment to TSU. In 2006, on its campus, she was the spokesperson for the Class of 1936 at their 70th Year Class Reunion. She enjoyed membership in the TSU Vintagers Club and the Legacy Society. She loved her Alma Mater and was always happy to visit the campus and take part in Alumni activities. Locally, she was a member of the Chattanooga Chapter of the TSU Alumni Association, where she enjoyed many activities and received many awards for her years of personal service and monetary support. The body will lie in state beginning at 12:00 noon on Friday, November 2, 2018. Viewing will begin at 4:00 pm. to 8:00 p.m. The Delta Sigma Theta Sorority’s Omega Omega Ceremony will begin at 5:30 pm. Family Visitation will be from 6:00 pm to 8:00pm. The funeral service will be held Saturday, November 3rd at 1:00 pm at Second Missionary Baptist Church with Rev. Paul A. McDaniel, Sr., Eulogist and Rev. Dr. Ernest L. Reid, Jr., Officiating. Interment: National Cemetery on Monday, November 5th at 1:00 pm Arrangements by John P. Franklin Funeral Home, 1101 Dodds Avenue, 622-9995. I am sorry to learn of the death of your beloved family member. Jehovah God made a promise to us all at Revelation 21:3-4 states, And he will wipe out every tear from their eyes, and death will be no more, neither will mourning nor outcry nor pain be anymore. The former things have passed away. Very soon now, we will never experience losing our loved ones in death. Sandra, my SISTER, The Lord so richly blessed you with a Godly mother. As her Caregiver, you couldn't have done anymore. I know that everyone who knew her was made to feel special. Her beautiful spirit was so captivating. I truly thanked the Lord for you and her. Thanks for welcoming this Delta into your home. Thank you for the stories and history shared. It meant so much. I thank God for bringing Arnold and Gloria Quarles into my life, thus making our acquaintance. You and the family will continue being in my prayers. Thus, Faith, Hope and Love, but the greatest of these is Love. God loves you, and so do I. Gloria Jones Poole, Southern Regional Rep 1974-76. Served with Regional Director, Yvonne Kennedy, our later 19th National President. I am praying for you and your family during this difficult season. God is our refuge and strength, a very present help in trouble. Psalm 46: 1. My prayer is that the Lord's tender mercy cover you forever. AMEN! Sandra and Family, The passing of the last Alpha Chi (Delta Sigma Theta/TSU) Charter member is being felt throughout Alpha Chi Membership. She was a fixture at every milestone anniversary Alpha Chi held at TSU while giving us words of wisdom and encouragement, as well as what it means to be a Delta. There was never a doubt of her love for Alpha Chi and Delta Sigma Theta. Her stylish red attire with hats to match and eloquence of speech and poise have given me as a member of Alpha Chi purpose to emulate and members to represent our sisterhood throughout the world May she rest in peace and God sends his comfort upon you and your family. Ms. Sandra and family, may the LORD grant to you comfort, strength, and peace in the coming days. Mrs. Hardin taught me at the old Chickamauga Elementary School in the Shepherd Community. She was a sweet, kind, loving person. Her smile was long lasting. She never forgot the students that she taught. When I reconnected with her at a function at the now Shepherd Community Center, I walked up to her and said "Mrs. Hardin it is so nice to see you. Do you remember me?" She immediately responded with that beautiful smile, "You're Lawanda Graves! How are you and what are you now doing?" She will be greatly missed! Sandra, my deepest sorrow go out to you and your family. I remember your mother from 2nd Baptist church from the West as side, Rev Mattin Ribbon days, i have always give your family the highest respect. Your mother legacy will live forever, my Mrs. Hardin RIP. Please accept my condolences to the family. It is unfortunate that I just found out that she passed and wasn't able to share in the home going of Mrs. Evelyn Hardin as I have been associated with the family while employed with Franklin Strickland Funeral Home. God be with all of you is my prayer. Dear Sandra, We are so sorry to hear of Evelyn's passing but we know your great faith in God will give you peace and faith that she is in God's loving arms.